Ecumenism and Interreligious Dialogue is a textbook that presents the teachings of the Catholic Faith on God’s desire to unite all humanity to himself and to each other through his Church. As such, it includes both ecumenism—action toward reuniting separated Christians—and interfaith dialogue—relations with non-Christians. “Introduction to Ecumenism” examines the problem that the Church seeks to solve: disunity among Catholics, Orthodox, and the many Protestant denominations?—?all of which are contrary to the will of Christ. Ecumenism is the task of healing these divisions, and the text sets out the guiding principles for ecumenical action that the Church has articulated. Chapter 1, “God Reveals His Plan of Salvation,” explains God’s original intention to share his inner, blessed, Trinitarian life with humanity and his subsequent plan of redemption achieved through salvation history in the promises and covenants of the Old Testament and fulfilled in the New Covenant of Jesus Christ. Chapter 2, “The Church as the Sacrament of Salvation,” examines the Church as the sign and instrument of the redemption and sanctification that God wishes to bestow on humanity. The Church has a visible structure given to it by Jesus Christ, who founded his Church on St.?Peter and the Apostles, entrusted to her the Deposit of Faith, endowed her with a Magisterium to preserve and interpret that Revelation, and commissioned her to spread this Faith throughout the world so that all people could be saved. Chapter 3, “The Church as the Sacrament of Communion,” looks at the Church as the sign and instrument of the loving unity of humanity with each other and with God, who is a communion of love in the Blessed Trinity. On earth this communion takes place in the Church, especially in the celebration of the Eucharist, which both symbolizes and effects Christian unity. Chapter 4, “Churches of the East,” studies the history of Christianity from her original unity through the growing estrangement between Eastern and Western Christian, which resulted in formal schism between the Western Church and most—but not all—of the Eastern Churches. The Catholic Church considers these true churches because they share Apostolic Succession and valid Sacraments. Chapter 5, “Ecclesial Communities in Western Christianity.” turns to the divisions that occurred in Western Europe due to the Protestant Reformation and the formation of thousands of Christian denominations. Because they possess a valid Baptism but lack Apostolic Succession and a valid Eucharist, the Catholic Church considers these bodies to be ecclesial communities rather than true churches even though their members are truly Christians and, hence, separated brothers. Chapter 6, “Ecumenical Efforts,” traces the rise of the ecumenical movement and the Church’s leadership in working toward Christian reunification, especially since the time of the Second Vatican Council. It also sets out Catholic ecumenical principles derived from the fundamental Christian principle to speak the truth in love. 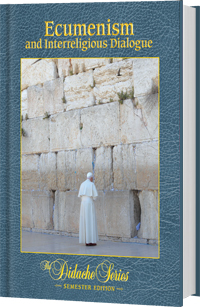 Chapter 7, “Relations between the Catholic Church and the Jewish People,” changes the focus from ecumenism to interreligious dialogue with non-Christians, beginning with God’s Chosen People, the Jews, from whom came the Redeemer and the Church herself. Dialogue with the Jewish people can enrich both religions mutually and help bring all humanity to faith in Christ. Chapter 8, “Islam and Other Non-Christian Religions,” continues to look at interfaith dialogue by studying Islam, Far Eastern non-Christian religions, and two non-Christian religions that arose in North America in the nineteenth century. When embarking on interfaith dialogue, Catholics seek first to find elements of authentic truth and goodness in every non-Christian religion. Chapter 9, “Proclamation and Dialogue: The New Evangelization,” examines the current challenge that Catholics face in reevangelizing people in their own nations who were once Christian but since have become secularized and even hostile to the Faith, leaving many of the baptized to live as nominal Christians. The text is written for high school students and is designed to be completed in one semester. This book, Ecumenism and Interreligious Dialogue, corresponds to Elective E: Ecumenical and Interreligious Issues in the curriculum framework.